[Radu Motisan] wrote in to share a cool project he has been working on lately, a pulsed microspot welder/cutter. The device is capable of spot welding thin metals such as foils and battery tabs by sending a pair of high current pulses between the two electrodes whenever [Radu] presses the trigger button. The cutting portion of his device uses the same general mechanism, though it requires a far greater number of pulses to get the work done. The welding/cutting process is controlled by an ATMega16, which is also tasked with taking input from the user and displaying information on the LCD panel. The microcontroller creates quick (in the ten to several hundred microsecond range) pulses for both welding and cutting, with the latter obviously requiring a long series of pulses. [Radu] started out using a relatively small capacitor array to power the device, but has recently upgraded to a 1.6 Farad car audio capacitor, which works (and looks) much better than before. His blog seems to update every few days with more pictures and details about his welding station, so be sure to check back often for updates. Be sure to stick around to see a short video of [Radu] adding metal tabs to batteries and tearing down an aluminum can with his cutter. Wow, this is very cool, this will make rebuilding batteries so much easier, thanks. Looks like a lot of time spent with a pulse control, but not enough time spent on the deployment side…. All the arcing is good for pictures, but not good for battery tab welding. did you even watch the whole video? 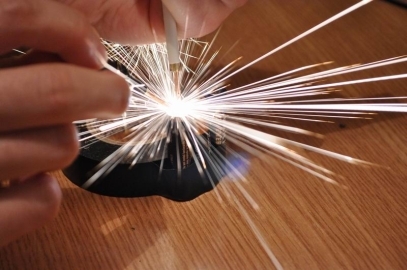 after the pictures he spot welds the tab in real time and you hardly see any sparks at all. I did. I stand with my statement. Very nice build, will consider for a future workshop build. My question however, is why would anyone want to solder tabs to alkaline batteries? Rechargables would make much more sense in the long run. Hey Jake… Did you think that maybe he didn’t want to waste an rechargeable for the demo? And markS… Why would he use a new tab to demo it? So it’ll look pretty for you? He obviously had plans to attempt to rip it from the end of the battery (as he did at the end). In fact, I’m more impressed at the fact it worked on someone used (as often many of us attempt to make repairs and not complete replacement of parts)… If it was a joke, might want to add some indications of such in the future. Congratulations sir, on an excellent project. Could this sort of thing be used for thicker, beefier metals? I do chainmaille as a hobby, and have been interested in upgrading to welding the rings shut. I work with aluminum, stainless steel and titanium in various gauges. It might work for the aluminum rings if you flatten the ends of the rings first, make a hole in one of the flattened ends, and then weld it shut… But I can guarantee that it won’t work on the titanium or stainless steel. The only thing I can think of that would reliably weld aluminum, stainless steel and titanium is a TIG welder. If you don’t want to spend a lot on a machine from Miller or Lincoln I hear there’s some half way decent Chinese imports. Here’s a link containing more videos explaining TIG. Stainless and titanium might not be a problem but aluminum could be. It would most likely require even more current. Shielding gas flow control could be a problem, but not an insurmountable one. Have you tried a TIG welding setup yet? Whatever happened to the controller promised for hackaday’s own spot welder? It was a great simple high current power supply, but they never followed up on it. but cutting a bear can a pair of scissor would a lot better job no? I don’t think bear would be too happy and a pair of scissors may not be enough to defend against angry bear. Would this weld thermistor wires? iliketoredstonesometimes liked L-Star: Software-Defined 6502 Computer. Alexander Zipper wrote a comment on 3D Printed Robot Actuator. 3lacksky wrote a reply on DIY Wireless Gamecube Controller. Prof. Fartsparkle liked Arcus-3D-P1 - Pick and Place for 3D printers. John has updated the project titled Kerbal Space Physical NavBall. emile.carry started following KiCad and FreeCAD Hack Chat. hwhardsoft has updated details to Arduino MKR touchscreen for top wall mounting. Jeffrey Phoon has added a new log for Dynamic Interactive _ Final Project. glasswoodaudio liked Gauss rifle v2.0.